Spread cheery tropical flavor around the home with this colorful hibiscus design on throw pillows, napkins, sweatshirts, bags and more! 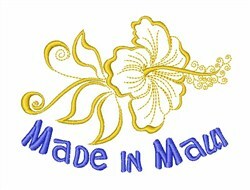 Satin Stitch is happy to present Hibiscus Made In Maui machine embroidery design which has 5312 stitches and is [88.11 mm x 66.89 mm] large. If you would like to view more embroidery patterns please search on our embroidery designs page.